Published on May 3, 2013 in Squash and Squash Competitions. 0 Comments Tags: 2020 Olympics, Olympic Bid, Squash, Squash In Olympics. Published on October 19, 2012 in Fun Stuff, Squash and Squash Competitions. 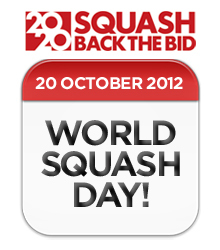 0 Comments Tags: 2020 Olympics, Olympic Bid, Squash Olympics, World Squash Day. 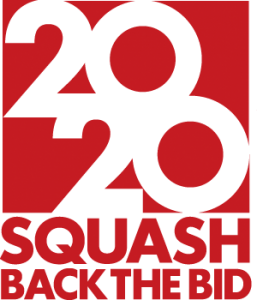 You can do your bit to get squash into the 2020 Olympics by joining the worldwide initiative Back The Bid… The best way is to go to your local squash club tomorrow – October 20th and participation in what will become a World Record event… World Squash Day. Published on January 21, 2012 in Champion Mindset, Inspiration, Motivation, Sports Books, Sports Psychology, Squash, Squash Competitions and Squash Tips. 0 Comments Tags: Jahangir Khan, Rahmat Khan, Squash Champion, Winning Squash. 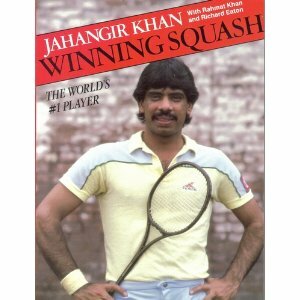 I recently visited a bookstore in Broadbeach on the Gold Coast (Australia), which has a great collection of used books, and found the ultimate squash classic by World Champion Jahangir Khan aptly named Winning Squash. Once you’ve mastered the basic strokes and court movement principles, as an elite squash player, you need to get into “A Champion Mindset” as often as you can. What I picked up from Winning Squash was Jahangir’s reliance on his cousin Rahmat Khan’s coaching skills and abilities. As a top squash player, reaching world #12 and a Khan, he understood and appreciated what it takes to be a champion. Without a mentor, coach, friend and advisor, there is no doubt in my mind (or Jahangir’s) that his achievements would have been much less prolific than they were. The key for any aspiring athlete is to get multiple points of view and then choose ONE that works. Listen, obey and respect that ONE voice. That ONE direction. That one FORCE. Otherwise what happens is you get splintered into multiple, divergent directions and lose momentum and confidence. Confidence makes a big difference in a quick-response sport like squash. With mere fractions of a second to choose a shot (or return), the brain needs to feel it’s capable of pushing the envelope to select the best shot to make, instantly calculating the risk/reward ratios involved. The second and almost as important revelation was Jahangir’s training regimen and mental focus. I expected this from the all-time-best squash player, but what I found interesting was how much of it was ‘trusting the coaching process’. Even back then (the book was published in 1985), Jahangir noticed that young players had difficulty succumbing to authority (elders, teachers and coaches). I can attest to that with adults of all ages. There is something inherently arrogant with athletes who think “they know it all” even though they continue to languish in the “B” leagues. Being coachable is a trait all champions possess. They recognise the need to have an outside perspective that focuses on them from a much more objective viewpoint with a set of skills designed and developed to extract the best from them. You can’t be ON the court AND watch the game at the same time. Each has a role and responsibility to the process of creating and sustaining excellence. Today’s elite athlete has to invest in the best technology and training which now includes psychological training well beyond the traditional visualisation and pre-match preparation techniques. Winning Squash is a classic – it captured the essence of the Champion Of All Champions – Jahangir Khan – at his apex of achievement. Published on October 18, 2011 in Champion Mindset, Sports Psychology, Squash, Squash Competitions and Squash Tips. 0 Comments Tags: Overcoming Obstacles, Peak Performance in Sport, Sport Motivation. If you’ve played a sport competitively, you know the frustration of being beaten by an opponent that you feel you can beat, but for whatever reason you can’t. I call that being on the wrong side of the Chasm Of Competence™. It’s when you don’t have the skill or ability to overcome your adversary… but you know you’re close, so close in fact you feel you could reach out and touch it. In my case, that watershed moment occurred at the 2009 Australian Masters Games when I lost the Gold Medal match to ‘win’ the Silver. 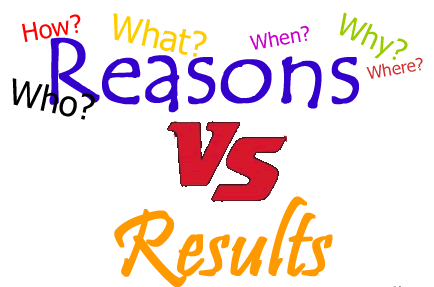 First, I believe we’re either REASONS or we’re RESULTS. So when I was losing and then lost the Gold Medal match, I made sure to make a complete list of all the REASONS I was losing as it was happening. I say while I was losing because I knew that with such a bad ref and an opponent who was exploiting the bad calls (not on purpose, but due to lack of ability on his part), the match was over early on. At the time, I wasn’t good enough to overcome my opponent AND the bad ref. I had never contemplated the extreme role a bad ref can have on a match. I was totally unprepared. So I made my list of REASONS and one by one, I solved them. It took two years to get the result (The Australian Masters Games are played every second year), but I knew I did everything to create the RESULT I wanted by removing all the REASONS. 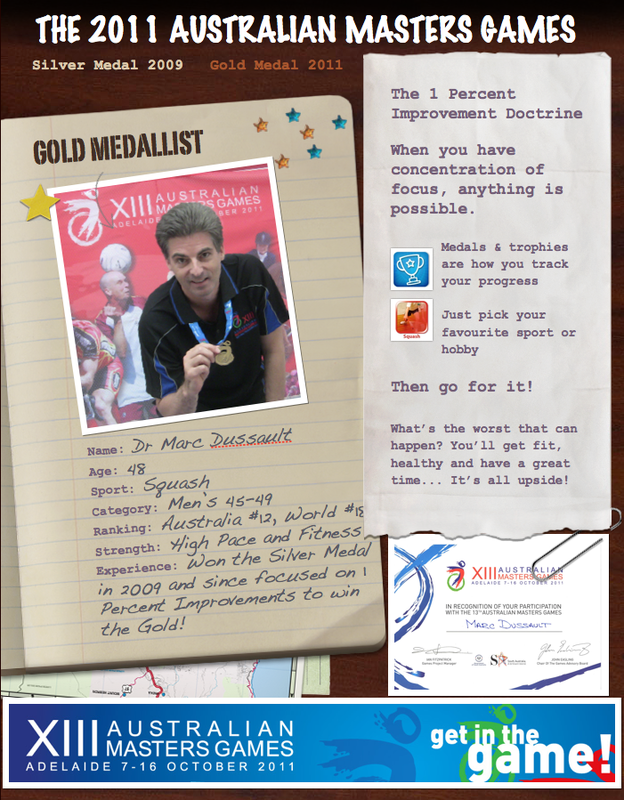 Published on October 14, 2011 in Champion Mindset, Inspiration, Motivation, Squash and Squash Competitions. 6 Comments Tags: Australian Masters Games, Squash. Two years in the making (the games are only held every odd numbered year), this victory is particularly sweet… Undefeated throughout the competition, I didn’t even give up a single game, this year was my year. Published on December 11, 2010 in Champion Mindset, Sports Psychology, Squash, Squash Competitions and Squash Tips. 1 Comment Tags: Performance Enhancement, Sport Tips. 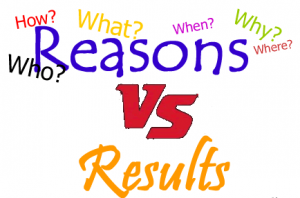 Today’s blog post is important if you’re an athlete who regularly competes in tournaments. One of the key concepts is NOT to become superstitious – if you do, you’re putting yourself at risk for no good reason. You want to create a routine, one that YOU CONTROL 100%, leaving nothing to chance. That means you need to document it so you can follow it carefully and methodically. If you don’t have a routine, you want to CREATE one. Here are some examples of what I do to get ready for a competition. I play 2 hours/day for at least 1 week, ideally 10 days up to 2-3 days before a tournament. That gives me endurance and stamina to last if matches go to 5 games as well as quickness and speed. I taper off by not playing for 2 to 3 days, depending on travel considerations. This allows me to recover and be ready with full guns blazing right from the start. Each night before a game, I watch at least one professional squash match – one that I’ve seen before that highlights the player(s) that emulate what I am focusing on for the next game. If I am going to make more “kill shots”, I will watch a match with at least one player who is playing that way. I will just watch him, almost ignoring his opponent. If I am concentrating on footwork, then I will watch another match with my eyes watching their feet and not the ball… Depending on your sport, you may not have access to videos or DVDs, then substitute it with a magazine or other visual cue. The reason I watch the match the night before (and just before going to sleep) is to focus my RAS on the techniques I have been practicing. Letting my subconscious do its magic. I will wake up based on my match time – VERY EARLY for a morning match and later for an afternoon start time. It’s important (for me) to be awake at least 3 hours before a match, otherwise I am not alert enough to play in “peak state”. You need to test this, once again – based on your sport of choice and your own preferences. I get to the squash facility one hour before my scheduled match. I’ve tried getting there closer to the start time and it throws me off if the court becomes available early – this is why you want to have a SYSTEM… To test and refine what works and what doesn’t. There are several other things I do, but am not willing to share in a public forum… but once the countdown starts, you MUST have another ‘countdown routine’ established – to handle your nerves and re-focus your excitement and arousal. I’ve blogged about arousal levels previously so I won’t go into that now. The ‘countdown’ routine you establish must remain within your control – don’t rely on your lucky shirt or shorts or some other superstitious crutch. Make sure your system stands on its own – preparing you for peak performance. Published on November 10, 2010 in General, Squash and Squash Competitions. 3 Comments Tags: Politics, Sport, Squash. Don’t get me wrong, I am a self-diagnosed squash addict and love the purity of the sport… That being said, it’s a dying sport in large part to failings by the people who (don’t) run it. First and foremost, the territorial in-fighting between the various ‘organisations’ is killing the goodwill that MUST exist for a sport to flourish. Squash clubs won’t promote events at other clubs for fear of…. I haven’t figured this one out yet, but they don’t do it. Instead of thinking exponentially, enabling, facilitating and enhancing their members’ experience, they hide and inhibit the growth of the sport that they need to grow. I don’t know about you, but I never thought I’d see the day when Mark Spitz’s record of 7 Gold Medals would ever be broken. Primarily because athletes today are so specialised that it would take a super-human to win THAT many medals against the specialists… But Michael Phelps did it with 8 Gold Medals – all in World Record Time in Beijing in 2008. Sports scientists are suggesting that training loads are increasing by what some estimate as 10 to 20 percent every five years! Mark Spitz, won his seven gold medals in the 1972 Olympics by swimming 9,000 meters per day. Within 20 years, the average COLLEGE swimmer was swimming more than this and by 1995, Olympic hopefuls were swimming a whopping 36,000 meters PER DAY. 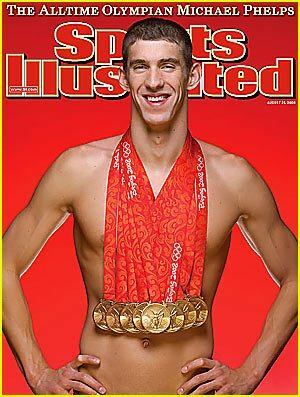 That’s no wonder why elite athletes are complaining. 28% and 10% of 1996 Summer and 1998 Winter Olympic athletes cited overtraining as the reason for their sub-optimal results. Trying too hard didn’t work. Published on May 9, 2010 in Champion Mindset, Inspiration, Motivation, Sports Psychology, Squash, Squash Competitions and Training and Drills. 1 Comment Tags: Accountability. In a previous post I discussed the perspective of champions, what gives them the winning edge and ended with an example of Mike Tyson, promising to explain what’s happened after his championship years ended. The word is accountability. In sport, competitors are held accountable to the sports rules, regulations and rankings. 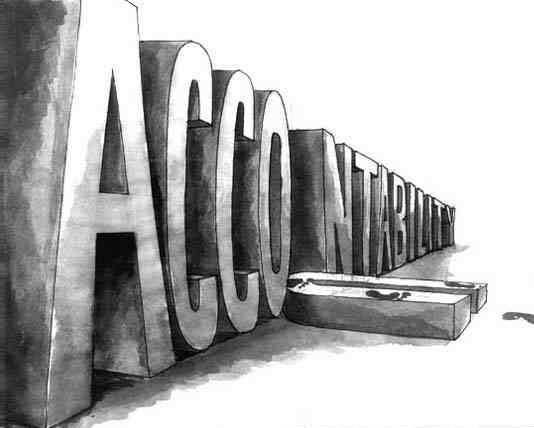 The higher the level, the more exacting and demanding the accountability becomes. If you don’t hold yourself to that standard, guess what? You lose, you fall in the rankings, game over.